It is now no secret that Motorola RAZR is the 1st biggest release by Motorola Mobility after Google acquisition. It will be available all over the world before the end of November. In Canada Rogers is going to offer this exclusive handset to its customers. If you are wishing to buy Android 2.3 running RAZR without any contract then the asking price is $649.99. 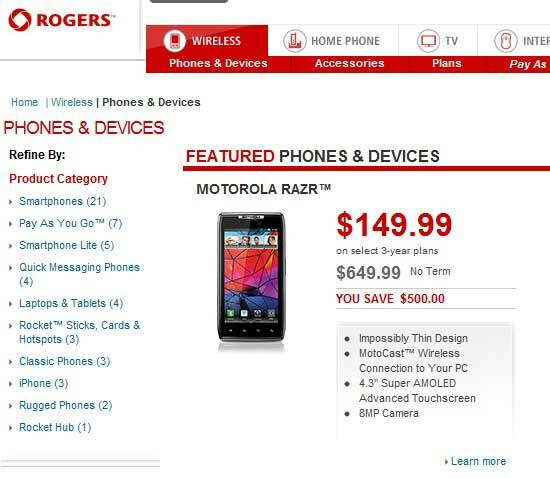 But in a 3-year contract Rogers is selling the device for only $149.99. But unfortunately no release date and details are not written on the Rogers website. I guess we will see the complete information pack after 11th November.